I have bought all the books on writing I know to buy. 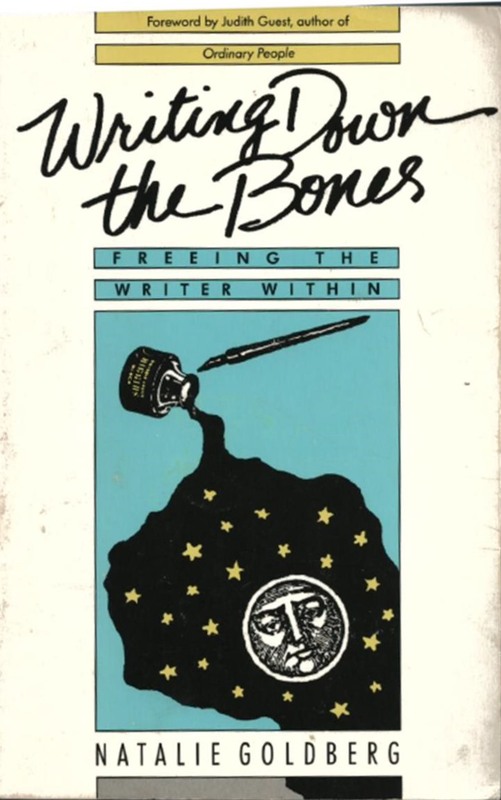 I have Stephen King’s On Writing, A Memoir of the Craft, Julia Cameron’s The Artist’s Way, Anne Lamott’s Bird by Bird, Jane Smiley’s 13 Ways of Looking at the Novel, and Natalie Goldberg’s Writing Down the Bones and Wild Mind, Living the Writer’s Life. They all say the same thing about developing your writing skill: write. Write Good. Write Bad. But Write. Reading about writing is not writing. It’s reading. All those authors, I’m sure, though are appreciative I paid Amazon with my debit card to buy their books. But their books, short stories, and essays are theirs, not mine. Mine are still jam packed in my mind. They’re like a tight knot in my shoe laces. I keep picking at the strings until one end finally breaks loose and it can all become untied. And then, once the two ends are flopping over my shoes, I can then pick them up and put them in a nice, tidy bow. If I were to recommend one of those books over the others, I pick Natalie and Writing Down the Bones. She offers the simplest, most practical approach in trying to teach someone how to write something more substantial than a letter to grandmother from summer camp. Natalie is still around in Taos, NM, living the artist’s life there. Her’s was the first book on writing I bought, so maybe I have a loyalty towards her because she was my first kiss with the writing life. But I followed through on what she suggested as a writing practice. And her method left the best memory of connection with others through writing. The three of us–Geraldine, Valerie, and me–met in my second story apartment and picked scraps of paper with random phrases from my wicker basket. We spent 20 minutes in stream of consciousness writing and then read aloud to each other. I loved both Geraldine and Valerie and they tolerated each other for me. I think Valerie, who was an artist, saw the words as an amplification of the images she created. Geraldine, an activist, saw the writing as a confirmation of her beliefs. And me. I was a journalist at the local paper and I saw the words as beautiful, illuminated stepping stones through the dark cave of stories in my mind. One of my goals I had when I moved to New Mexico was to attend one of Natalie’s workshops. I never have. I don’t know why. I guess I am afraid the sparkle of her personality in the written form won’t translate in a one-to-one contact. I met Jane Smiley in person one time and this happened with her. I thought she was aloof, shy, and awkward in person. Not at all fluid and flexible as she is in the many books of hers I read. I guess I don’t want to risk a similar disappointment with Natalie who has connected with me so well through her writing abilities. It’s been awhile since I’ve read Writing Down the Bones. I think it might be time to excavate it from the bookshelf grave.